Seriously. It seemed like such a great idea. A really great idea. And if we could pull it off, it would be such a huge accomplishment. HUGE accomplishment. We really should be able to make it to 1 o'clock church on time. Even early enough to actually sit on a cushioned bench. But we don't. We are late. And we sit with the overflow crowd where cheerios fly, kids scream, and Lightening McQueen casually rolls past me. I mean, we are so much better than that. So we planned ahead. Saturday was the "get-the-work-done-day" where we cleaned the house and ironed our clothes (that song totally works). And Sunday, we were ready and out the door by 12:32pm. Enough time to actually walk and wagon ride to church. And since gas costs as much as my right hand is worth, it seemed like another good idea. We arrived. We wisely selected the very last cushioned bench (our fat baby still requires quick getaways when he belts out a good screaming fit) and it fit our family perfectly. We each had a good 6 inches between us, with an adult at each end. The little boys were trapped. It was heaven. I took a deep breath of relief and satisfaction. We did it! We really did it! And then Sister M. sat in front of us, turned around and said "You guys don't usually sit here! And you're even here early?!" It all went downhill from there. And real life lessons were learned. -We learned that there is an unofficial seating chart. -We learned that the bench seats are reserved for the elite- people who have no more than 2 children, children 8 and older, grown children, no children... QUIET children... you get the picture. -We learned that our little boys have little appreciation for the bench seats, and absolutely no regard for coloring quietly, let alone sitting reverently. -We learned that Sister P. really enjoyed watching the circus show that we unintentionally were. -We learned that Jack hates being trapped. -We learned that it will be a LONG time before we ever enjoy Sacrament Meeting. -We learned that we aren't any better than the overflow crowd, but that they are our kind of people, and that's where we belong. We tried. We tried really, really hard. Best effort. Good intentions. But by 2pm, Aaron and I, at opposite ends of the bench, trying to manage 5 children (including 2 teenagers who still have yet to learn reverence) stood simultaneously, each with a screaming child in hand, and headed for the foyer. The war was over, and the parents lost. Oh, and the walk and wagon ride back home... it was all uphill. And excruciating. So next week we will still try to be on time. We will drive. We will promptly take our place in the overflow amongst the cheerios, patiently wait for our peeps to file in 15 minutes late, and anxiously watch for Lightening to make his appearance. Because while we are failing miserably at teaching our boys and teenagers reverence, at least we can be early to sit right where we belong. I know the feelings..There were few times I have been embarrassed when I was trying to teach my sons to behave properly. One of the examples I would never use inappropriate words in the house. Well one day out of blue,my younger son spoke clear and loud in front of other children and adults by telling the roll-attendance leader "You're Idiot!" It was coming from the 101 Dalmatian. Of course, I was approached by another adult of what was happening. How was I supposed to prevent that, too? Another time, I have had my older son yelling at me at the store when I told him I wouldn't buy him a new toy. He screamed out loud, " I wanted to move out and live with another family." I have another people looking at me like as I was a lousy mother. There were times you, other parents and I only could try our best by teaching the appropriate manners throughout the years. No matter how hard it is! But it is something we, as parents, will always remember the "painful" memories. In addition, our unconditional love remains longer than going through suffering of what we would like to see our children. I loved it! That is so funny. My mom is one of those people that has a bench and will leave home 1/2 hour before the meeting starts to save HER benches, she saves us one too! At least your kids aren't swearing in church. Alyza, when she was 2-3 years old said "s##t" in church. Keep up the good work, eventually your kids will get what you are teaching them! i love you so much. you make me laugh. i think you and josh are more than in-laws. i think you are blood! you need to seriously consider writing a column for a magazine. you have a talent my dear. keep it up! Too funny! You guys are awesome parents and some day you two will be childless and can sit in the front on the padded bench and smile at the poor parents that are trying to wrangle their little ones and still pay attention. Oh, always ask for the seating chart in every ward you go to otherwise it's dirty looks and trouble if you don't. We made it to bench also for the first time yesterday. Yeah, I don't know if the effort is worth it because 4 of us were in the all and we left 2on a huge bench all by themselves. I am not sure if a 9 and 7 year old should take up about 10 - 15 feet worth of prime reality! Was that our Lightning McQueen, by chance? P.S. I had no idea about the seating chart....maybe that's cuz we've never made it for the padded benches. Well, I agree with Deby...one day you will miss those 5 children sitting next to you and all you will want to do is ask young moms if you can borrow one of their kids during sacrament, to remember the good times! ps. pretty sure I couldnt EVER get out early enough to walk! Props! Not only do we sit in the overflow, but we sit right by an exit. LOL! My whole ward is the overflow crowd so you have to get there early to get the back row. So funny! You are hilarious and I wish we were in your ward so we could share some cheerios. I am one of those that has a row! Right now it is so we can see our Dad who is up on the stand. But, following my Mother's footsteps, we have always been a second row family. One Sunday years ago, we got there as the opening song was ending. Tyler was about 6 at the time. 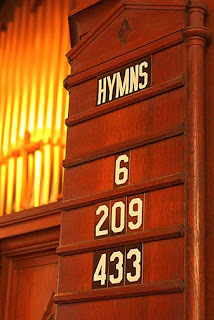 He went in first, and got to "our" row as the hymn ended. There was someone sitting there. He turned to me, rather disgusted and said, with attitude, "Now where are we supposed to sit?!" That poor man never sat there again. But be happy, out here in TN there is no overflow. In fact on Sun. I had to lead the music for Sacrament Mtg. (got the head nod from hubby during the opening remarks after the organist mentioned there was no one there to lead) Anyways, on the right side of the chapel there were about 5 people. No problem getting a cushy bench out here. Mandee you make me smile... we would be such wonderful friends in real life. I'm sure of it. Also, if everyone out there is guilty of getting to church late who are those people who are on time? Our last stake conference had an entire theme of being on time to church. Sad.